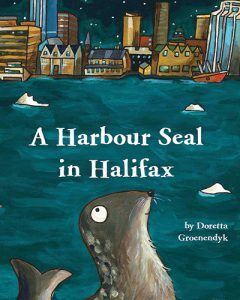 A Harbour Seal in Halifax tells the true story of a harbour seal’s adventure in downtown Halifax. The comic book style frames in this picture book support the text beautifully and make for a great read aloud and read along book about a seal on the streets of Halifax at night. Luckily for Seal, the compassionate Officer and Constable were working and were able to help her out. Seal liked the lights of the city, but the puddles were too small to swim. With some quick thinking and a blanket, Seal was moved safely to the harbour where she happily performed a show of thanks and swam away. The story uses simple words and clear descriptors of the seal, the night, people and Halifax, making it an easy to read book. The detailed images and comic book style layout will catch the attention of older readers as well. Classroom Connections: Great for reading aloud, independent reading and for teaching illustration techniques. Reading Comprehension Strategies: Making Predictions, Making Connections, Inferring.